Offers a chronological timeline of important dates, events, and milestones in Washington history. Human beings arrive in North America via a land bridge connecting Siberia and Alaska. This was once thought to be 12,000 to 13,000 years ago. But archeological evidence is pushing the date back, perhaps even to 30,000 years ago. It is also likely that some of the First Peoples of North America arrived from Asia by boat. As the Ice Age ends about 15,000 years ago, a series of huge "Spokane Floods"unleashed by breaking ice dams carve the Grand Coulee, and the retreating Vashon Glacier leaves behind Puget Sound. Granted statehood in 1889, Washington was named in honor of George Washington; it is the only U.S. state named after a president. 1741-43 - Russian explorers reach Alaskan islands and coast and trade with native peoples for sea otter pelts. 1774 - Juan Perez commands the first Spanish expedition to explore the Northwest Coast and sights the Olympic Mountains. 1775 - Bruno de Hezeta lands on the Washington coast and claims the area for Spain. On his return south, he sees the mouth of the Columbia River. 1778 - James Cook (British) explores and charts the Northwest Coast. 1789 - George Washington is elected the first president of the United States. Robert Gray (American) names the Columbia River after his ship. George Vancouver (British) explores and names Puget Sound and Lieutenant William Broughton explores the Columbia River up to Point Vancouver. 1803-1806: Captains William Clark and Meriwether Lewis lead the Corps of Discovery's Transcontinental Expedition of the lands west of the Missouri River. 1805-1806 - Lewis and Clark enter Washington and stay at Fort Clatsop on the south side of the mouth of the Columbia River. 1807-1811 - David Thompson charts the Columbia River. David Thompson maps the Columbia from its headwaters. 1818 - United States and Great Britain agree to joint occupation of the Oregon Territory. 1823 - Monroe Doctrine warns other countries against attempting occupation in US claimed lands. 1824 - Bureau of Indian Affairs is set up in the War Department. Russia sets its southern boundary in the Pacific Northwest at 54 degrees, 40 minutes. 1825 - Hudson's Bay Company establishes forts Vancouver and Colvile on the Columbia. 1831 - Department of Indian Affairs is set up in the Department of the Interior. New duties include dealing with Native American nations in the West. 1834 - The Whitman Party, including Dr. Marcus Whitman and his wife Narcissa and also Reverend H. H. Spalding and his wife Eliza set up mission at the junction of the Columbia and Snake Rivers. Their travel route would become known as the Oregon Trail and used by thousands of future settlers. 1839 - Fr. Pierre-Jean DeSmet arrives among the Flatheads in the Bitterroot Valley. He and his staff would set up a number of Jesuit missions in present day states of Washington and Idaho. United States naval expedition, headed by Charles Wilkes, explores Washington. The Western Emigration Society, a group of settlers bound for California and the Oregon Territory led by John Bidwell, set off on the Oregon Trail. 1842 - John C. Fremont leads an Army Topographical Corps' Expedition to the Rocky Mountains. He witnesses an eruption of Mt. St. Helens. His maps of this expedition and one the following year are printed by the government and are widely used by pioneers heading west. 1843 -The Great Migration, a rush of approximately 1,000 pioneers, head out on the Oregon Trail, led by Dr. Marcus Whitman. 1844 - James K. Polk becomes President of the United States. Among his four goals is the designation of the Oregon Territory's northern border to extend to 54' 40", even if through an act of war. 1846 - Treaty between United States and Great Britain sets boundary at 49th parallel. 1847 - Cayuse Indians attack Whitman Mission in Walla Walla. 1848 - Oregon Territory created. 1851 - First settlers land on the site of Seattle. Farmers living north of the Columbia River successfully argue for Congress to declare the region Washington Territory. It encompasses land east to the Rocky Mountains that are today Idaho and part of Montana. 1854-1856 - A number of treaties are signed between Native Americans living in Washington Territory and the U. S. government. 1855 - Walla Walla Treaty Council. 1859 - Oregon joins the Union as a Free State. 1860s - Gold and silver discovered in the Okanogan. 1861 - The battle at Fort Sumter marks the beginning of the Civil War. 1862 - Congress passes the Pacific Railroad Act, giving Central Pacific and Union Pacific Companies permission and land grants to begin construction of a transcontinental railroad line stretching along the 42nd parallel. 1863 - Idaho Territory is formed. 1864 - Montana Territory is formed. 1865 - Civil War ends. Union Pacific Railroad heads west. 1871 - Indian Appropriations Act states that Indians are no longer considered sovereign nations but wards of the federal government. The American-British border dispute in the San Juan islands is settled via arbitration by the German emperor, Kaiser Wilhelm. 1883 - Northern Pacific Railroad completed to Tacoma, linking Washington to the East. 1886 - Coal mining town of Roslyn founded; Mine operated by the Northern Pacific Coal Company. 1887 - Dawes Severalty Act is passed. Indian lands are split into individual allotments, with remaining lands becoming public and therefore up for sale. Colville Reservation begins allotment process in 1906. 1888 - Stampede Tunnel of the Northern Pacific Railroad completed across the Cascades. 1893 - Great Northern Railroad completed to Seattle. 1897-99 - Klondike Gold Rush; Seattle grows quickly as a jump-off point for people heading to the gold fields. 1899 - Mount Rainier National Park established. 1900 - Frederick Weyerhaeuser sets up a logging business in western Washington. 1902 - Reclamation Service begins irrigation project in Yakima and Okanogan valleys to facilitate farming. 1903 - Iron Chink fish cleaning machine invented by Seattleite Edmund A. Smith. Under the Dawes Act, tribal lands on the south half of the Colville.Reservation not then allotted are declared up for sale to white settlers. 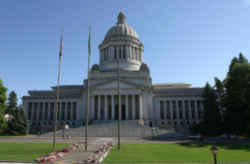 The Washington State Highway Department is formed, to oversee the construction and maintenance of roads and highways. Mount Olympus National Monument established. 1910 - Women gain the right to vote in Washington. 1914 - Finnish immigrant Oscar Wirkkala invents the "spar logging" technique. 1914-1918 - World War I.
Fort Lewis (United States Army) established. 1919 - Seattle general strike; labor violence in Centralia. 1929 - US stock market crashes. 1931 - Hoovervilles appear in many cities, glaring evidence of high unemployment rates. President Franklin D. Roosevelt begins New Deal programs; Grand Coulee Dam begun. 1934 - Indian Reorganization Act sets up Tribal Business Councils and promotes the return of communal ownership of reservation lands, in order to create self-sufficiency. 1937 - Bonneville Dam on the Columbia River completed. 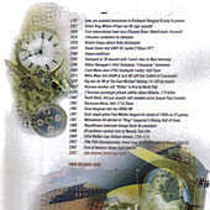 December: Pearl Harbor, Hawaii bombed by Japan. 1943 - Hanford Engineer Works built to produce plutonium for the WWII bomb "Little Boy". 1939-45 - World War II August: US bombs Hiroshima and Nagasaki to help end WWII. 1948 - Washington's first TV station (KING-TV) begins broadcasting in Seattle. 1954 - First flight of Boeing 707, first jet transport. 1957 - Washington Public Power Supply System (WPSS) created to develop Washington's energy resources. 1962 - Seattle World's Fair. 1975 - Microsoft founded, major producer of computer software. 1976 - Dixy Lee Ray, first woman governor of Washington elected. 1980 - Mount St. Helens erupted, scattering ash throughout the state. 1987 - Clovis Points discovered in an East Wenatchee orchard. 1989 - Washington's centennial of statehood. 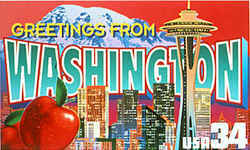 1996 - The new Washington State History Museum opened. 2001 - Seattle Communist Party office closed.